L’Eglise Saint-Roch was filled with floral tributes from all the important names connected with Paris haute couture. The priest, Rev. Christian Lancrey-Javel said, as he helped lay a black lace shroud on the coffin, “The indefatigable Francois Lesage might be up there now busily embroidering the wings of angels. I would never turn down an invitation to lunch with a very attractive Frenchman so when Francois Lesage invited me to lunch with him at Bistro Gardens in Beverly Hills in 1989 I accepted with great pleasure. And lunch naturally turned into a Santa Barbara News-Press column for me. Following luncheon I went with him to the I. Magnin‘s department store, now also departed, in Beverly Hills to see the new House of Lesage collection of jewelry being sold there. 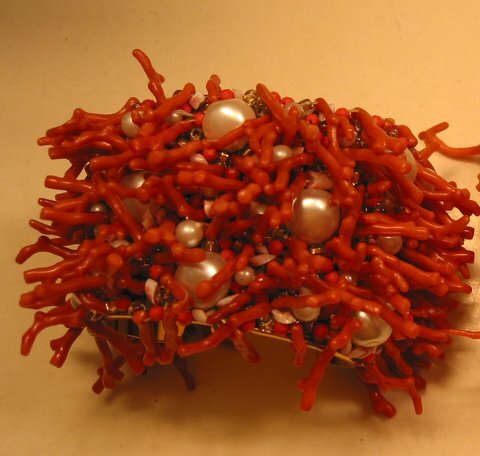 Well it turned into quite an expensive luncheon because I could not resist a lovely coral and pearl bracelet I spotted. Now sadly I read in London obituaries that Francois Lesage has died at the age of 82 after a long illness. He was a truly charming gentleman with fine sense of humor and he was in a business that absolutely and totally fascinated me. In 1924 Albert and Marie Louise Lesage, his parents, purchased an embroidery firm Michonet which had once been embroiderers to Napoleon III. In 1925 they changed the name and it became the House of Lesage, an embroidery business specializing in a technique that enables a greater range of shades in beads or thread within one color and a wider range of different colors. Their technique was first put to use by the famous designer of the period Madeleine Vionnet. At the age of 18 Marie Louise and Albert’s son Francoise left Paris and went to Hollywood to learn contemporary costume decoration from the famous studio designers including Edith Head, Irene, Adrian and especially my adored friend the late Jean Louis. One of the most famous dresses in the 20th century was the great gown Jean designed for Marlene Dietrich to wear in one of her Los Vegas performances and that gown was beaded by Lesage in Paris. To see the great Dietrich in this incredible gown, covered on entrance by the most glamorous luxurious white fox coat with train ever made, was a never to be forgotten experience. The beading was done on transparent silk and there was great debate about whether you could really see through it or not. I couldn’t tell when I sat up close for a performance in Las Vegas and Jean never confided the truth to me! He could be a real pixie! Before Albert Lesage died in 1949 Francoise Lesage did well in Hollywood. 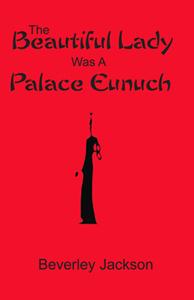 He had ultimately opened his own boutique on the Sunset Strip where all the big stars were his customers. But it was goodbye Hollywood and all its glamour when Albert died. Back to Paris to take over the family firm. However he went back to other stars, Yves Saint Laurent, Balenciaga, Schiaparelli, Balmain, Dior, Givency… The beading that Lesage created for the great haute couture gowns can probably never be accomplished again in the future. The artisans who executed the designs are dying out, although looking ahead Francois set up am embroidery school in 1992 connected with his workshops for young people to learn the great techniques of embroidery and beading past. Chanel who bought the House of Lesage in 2002, following his example, have I understand recently purchased a famous Parisan feathermaker Andre Lemarie so that another ancient art can be passed on to future generations. The two items I have ever most coveted in western design (we’re not counting imperial Chinese robes here!) were beaded by Lesage. One was a jacket for Saint Laurent solidly beaded on a design of Van Gogh sunflowers. The beading was done in layers to display the thick areas of paint in Van Gogh’s work. And the price of the jacket was in a range with a small Van Gogh painting of the time. And worth it. More than 600 hours of work went into each jacket. Speaking of value of work, the wedding dress Lesage beaded for King Khaled of Saudi Arabia’s daughter is said to have cost 60 million French francs, approximately 11 million U.S. dollars at the time. That’s a lot of beads, sequins and pearls! Or maybe real gems? 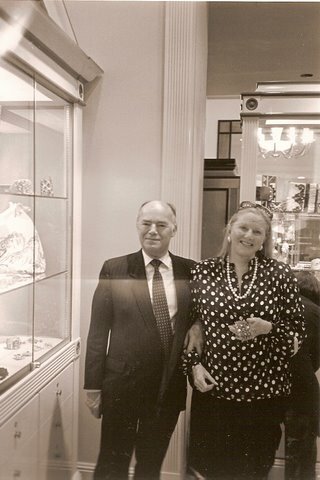 Luckily for me one of new things Francois ultimately did was go into a line of jewelry and beaded accessories created by Gerard Tremolet for Lesage in 1987. Lucky for me because I could finally afford Lesage — the bracelet and a pair of earrings! The other piece I coveted was a Christian Dior ball gown from the collection of 1949. I won’t try to describe it but here is a picture. It was perfection! Several of them were sold. I saw one close up in an exhibition of Dior in New York at the Metropolitan Museum years ago. That gown had been made for Mrs. Byron Foy who had donated it to the museum. The other time I saw it was at the marvelous “Hommage a Christian Dior 1947-1957” exhibition in Paris in 1988. This exhibition also displayed framed “samples” of the great beading used on the gowns which were prepared for designers to chose from. For every collection, spring, fall, winter, summer from 250 to 300 samples were made by Lesage for their customers to chose from. One sample represents 40 to 60 hours of work and about 100,000 stitches. Each year Lesage uses 750 pounds of pearls keeping a lot of oysters busy! And 100 million sequins are used. Lesage beading does indeed deserve to be framed. Or preserved somehow. 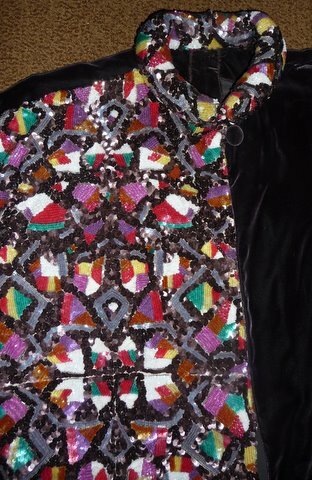 A very old Galanos dress that could never fit again but had great Lesage beading found a second life as part of a brown velvet jacket my clever dressmaker and friend Quy created. Quy was fascinated working on it as there was some cutting and piecing needed and the Lesage work was so finely done not one single bead came loose in the process. 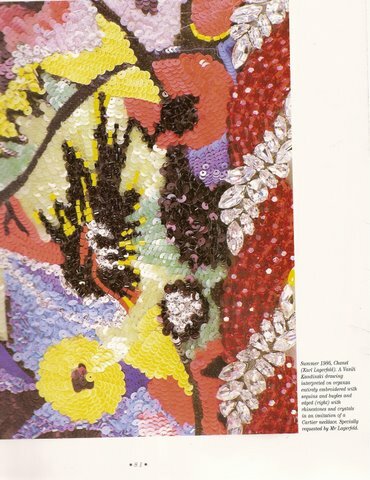 I found an original design for beaded work in “The Master Touch of Lesage” by Palmer White that was created orignally for Karl Lagerfeld in 1986. Comparing it with my embroidery, Jimmy Galanos might have been influenced by that design for Lagerfeld, eliminating a very elaborate border of a supposed ruby and diamond Cartier necklace and going heavy on tiny yellow, orange, red and white sequins. If I’d found this earlier in life I could have tried to verified it. Galanos was a close friend of the late Maggie and Jean Louis and we were together at their New Year’s eve parties in Montecito most years. This comes to mind as New Year’s eve is upon us now. Francois Lesage, working with his skilled beaders and embroiderers, produced great beauty during his lifetime. In my opinion he deserves to be considered a great artist. And as I said originally, a very charming man. Lesage was such a great artist ! Love your title very much too.. It was amazing, my child, execpt that it was McDonalds! Fight the fight people, a child should be able to get whatever toy the child wants, and should not have to have a gender specific toy regardless of the toy!